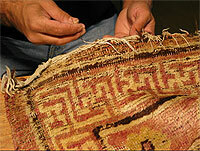 Persian rug cleaning services for Pasadena are provided by Antique Rug Company. We serve all Pasadena and surrounding areas including zip codes 91110, 91102, 91129, 91105, 91103, 91101, 91188, 91126, 91106, 91124, 91189, 91117, 91001, 91109, 91125, 91182, 91107, 91114, 91116, 91108, 91121, 91184, 91123, 91115, 91104, 91031, 91030 and 91107. We offer pick-up and delivery for Pasadena and surrounding areas.